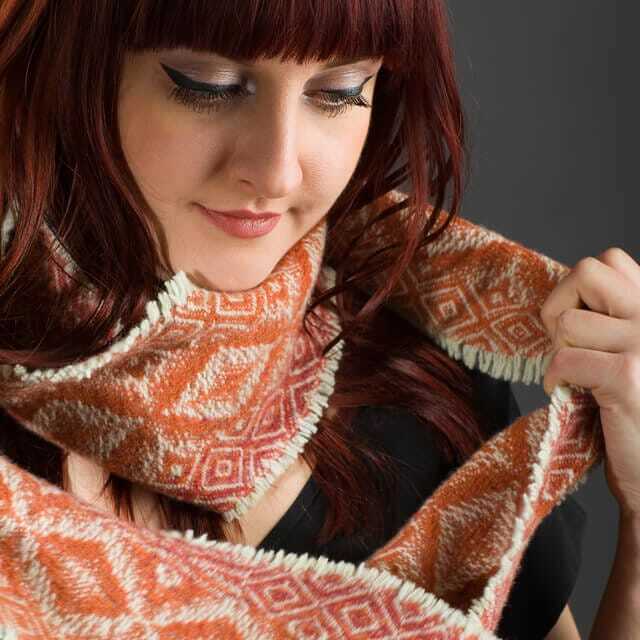 A beautiful warm-hued scarf from the Kaleidoscope collection of wearable pieces in merino lambswool. This could well be the perfect woollen… gloriously soft, non-itchy and not too bulky. Just the thing to keep you smiling in a draughty office or stop that wind going through you. Each piece is hand woven in merino lambs wool yarns on James’ trusty 32-shaft computerised loom using a progressive twill structure, then hand finished, washed and air dried. Add this colourful pop of cosy luxury to your wardrobe and run the risk of never ever wanting to take it off. You’ve been warned. A weaver for over 20 years, James Donald truly is a man of the cloth. After studying textiles at Duncan of Jordanstone College of Art, he explored Australia before setting up PickOne in 1997 to hand-weave sumptuous fabric for clothing and occasional home wares collections. At the core of his method is a creative marriage between contemporary technology and traditional hand-weaving techniques. The 32 shafts on his computerised loom allow him to showcase more complex designs in a wide range of yarns. Most recently, his collections have been exclusively crafted in merino lambswool. James’ inspiration is fuelled by the rich textures and sweeping vistas of Scottish land and seascapes, particularly in the Outer Hebrides, the Shetland Islands and the highlands of Scotland. Combine these with a sharp eye for colour and texture trends, and you have textiles to sigh for. 'I enjoy weaving for the flow of process from one row to the next, observing the cloth grow before me in a repetitive, meditative and rhythmic action.